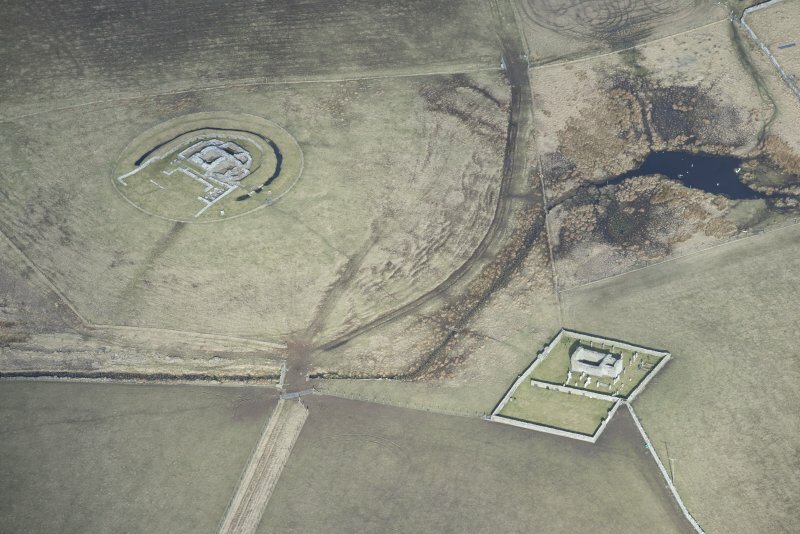 Oblique aerial view centred on the remains of Cubbie Roo's castle with the chapel and farm adjacent, taken from the ESE. 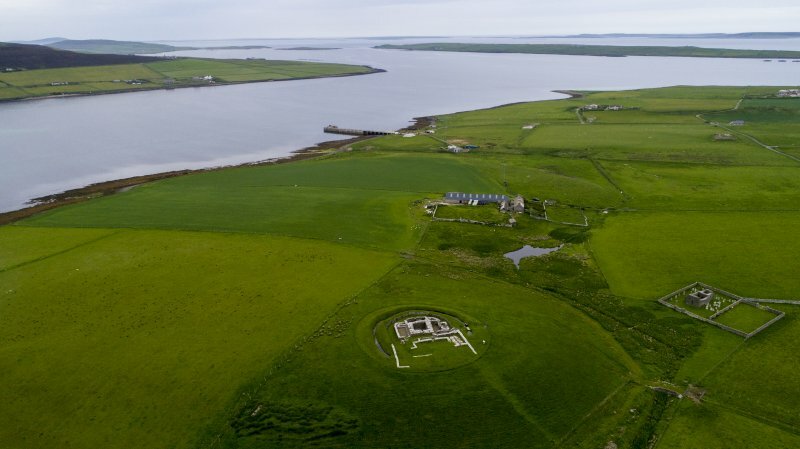 Oblique aerial view centred on Cubbie Roo's Castle with St Mary's Chapel and The Bu farmstead adjacent, taken from the NE. 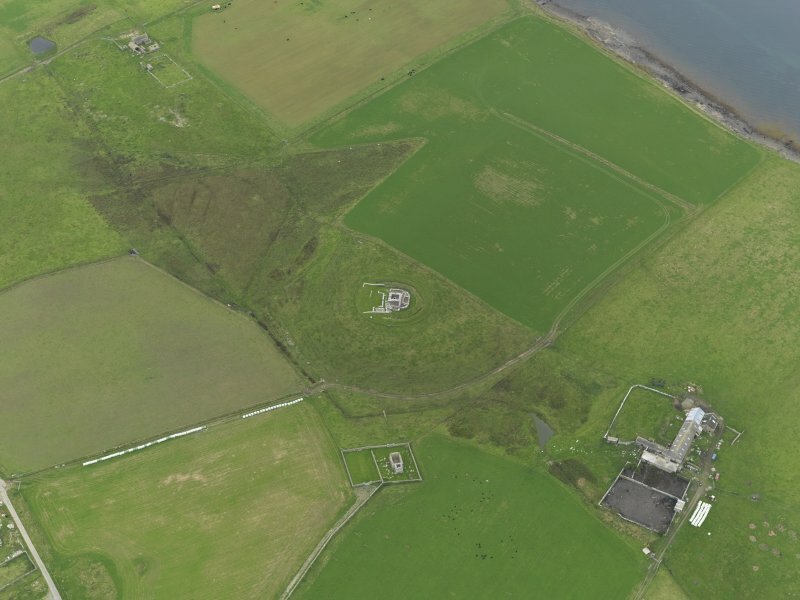 Oblique aerial view centred on Cubbie Roo's Castle with St Mary's Chapel and The Bu farmstead adjacent, taken from the E.
Oblique aerial view centred on the remains of Cubbie Roo's castle with the chapel adjacent, taken from the NE. Detail of fireplace and oven in N outbuilding. 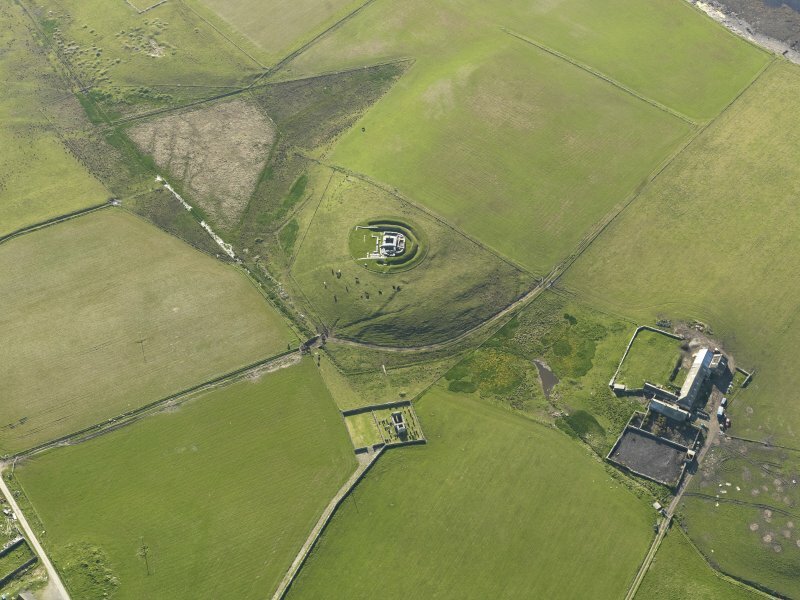 Oblique aerial view centred on the remains of the castle with the chapel and farm adjacent, taken from the SSE. 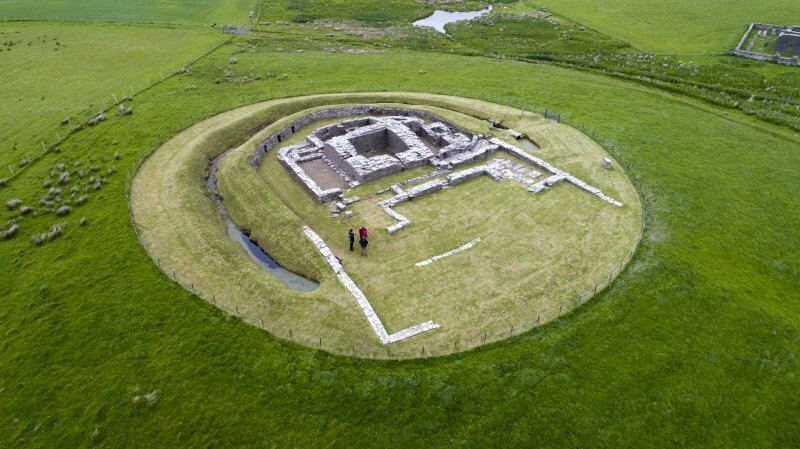 Dating from the Norse occupation, remains of the oldest medieval castle known to exist in Scotland. 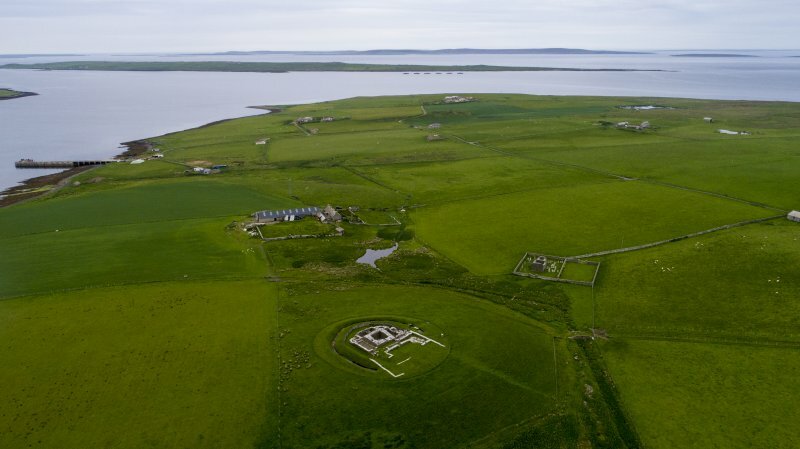 The Orkneyinga Saga tells how, about 1145, Kolbein Hruga built a fine stone castle (steinkastala) on the island of Wyre. Cobbie Row is a corrupted form of this name, and as examination has failed to yield traces of earlier structures, then the existing remains are the steinkastala (W D Simpson 1954). 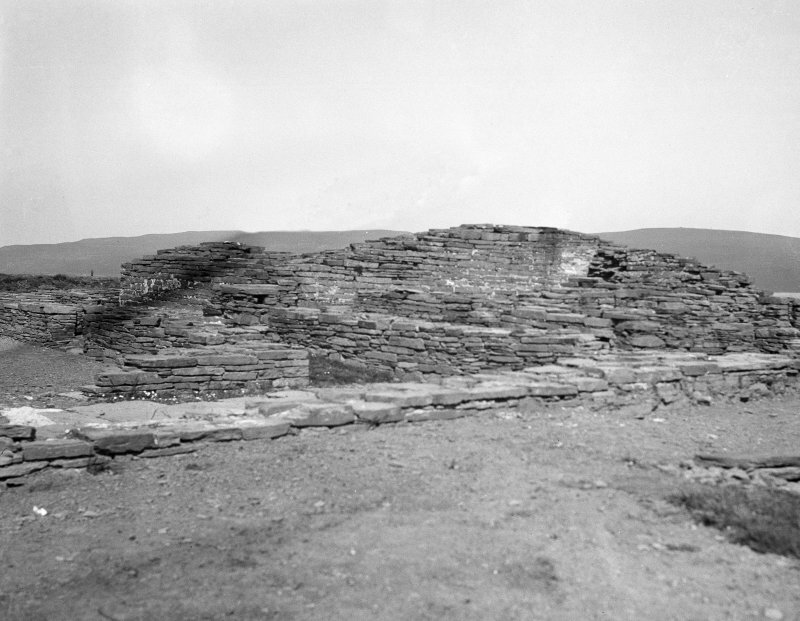 Near the centre of the platform and earliest in date is a small tower, almost square, which stands to a height of about 8 ft. 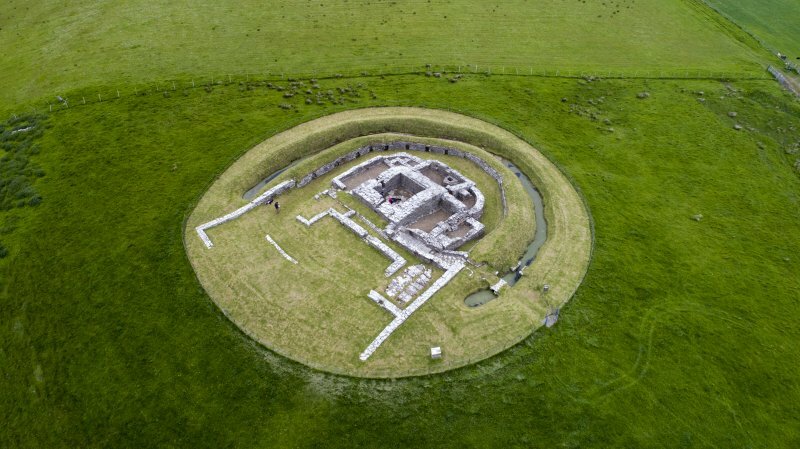 It measures 25 ft 7 ins by 26 ft over walls 5 ft 7 ins thick at base, and its masonry is of undressed flagstones. 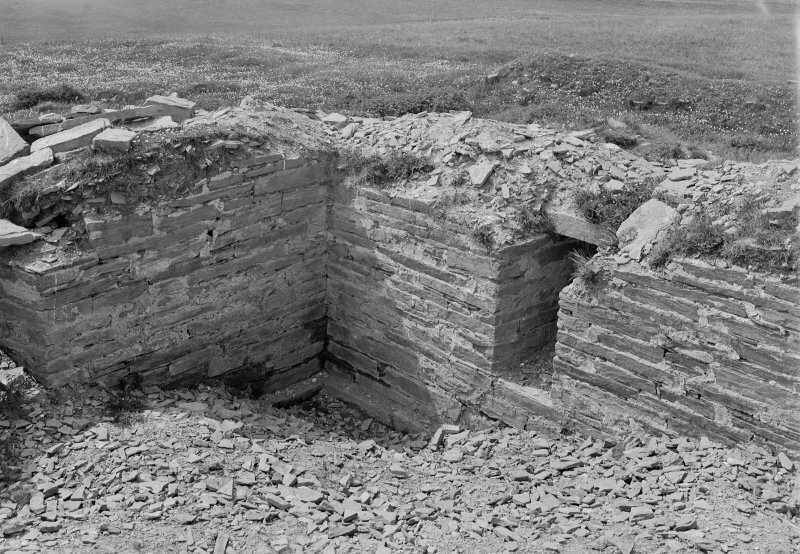 Dr Marwick points out that the entrance must have been in the missing first floor and what remains is a well-room and storehouse. There is insufficient evidence from which to date this tower. 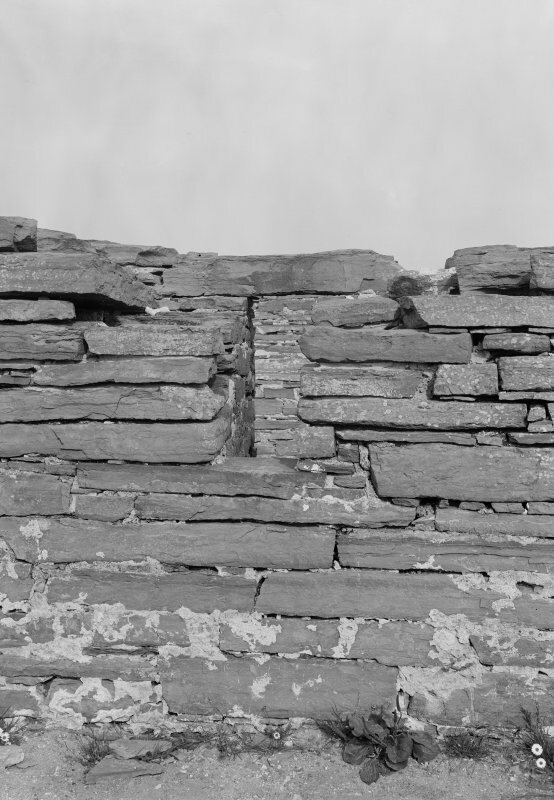 The masonry in no way resembles that of the enclosing wall, which may be considered original. It does not differ greatly in construction from the walling of the chapel (HY42NW 4) but it is better and more substantial. 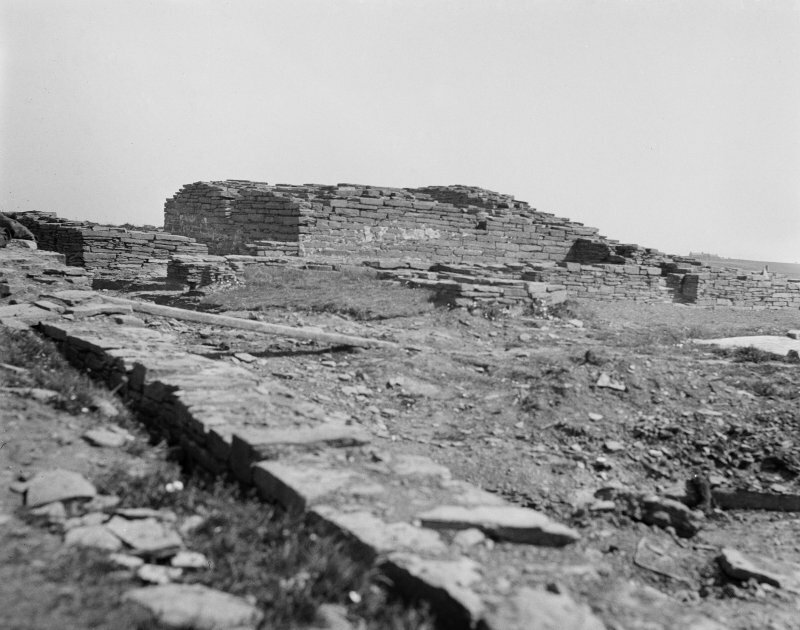 It is unsafe to assume that a personal tower was erected by a layman as early as the middle of the 12th century, especially in the total absence of any evidence. A fragment of chain mail found on the site might belong to any period from the 12th to 15th century. 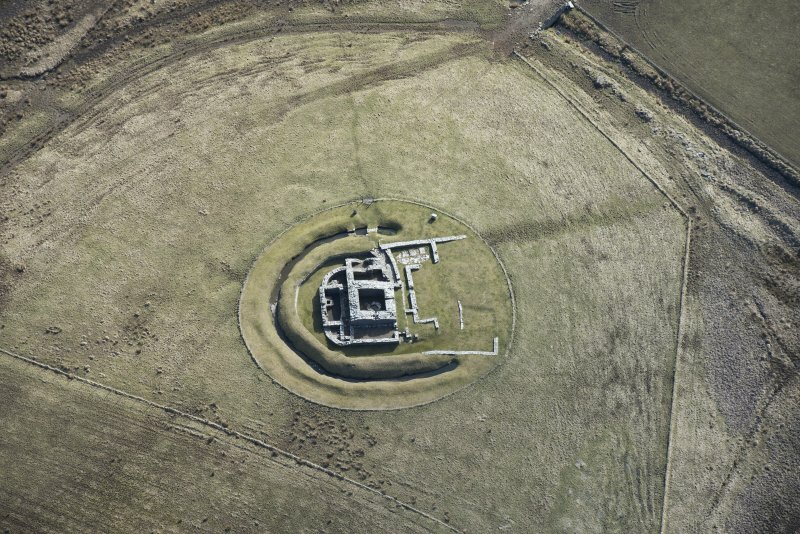 First Addition: By a subsequent addition to the NE corner, the tower became L-shaped. This addition had at least one upper floor. 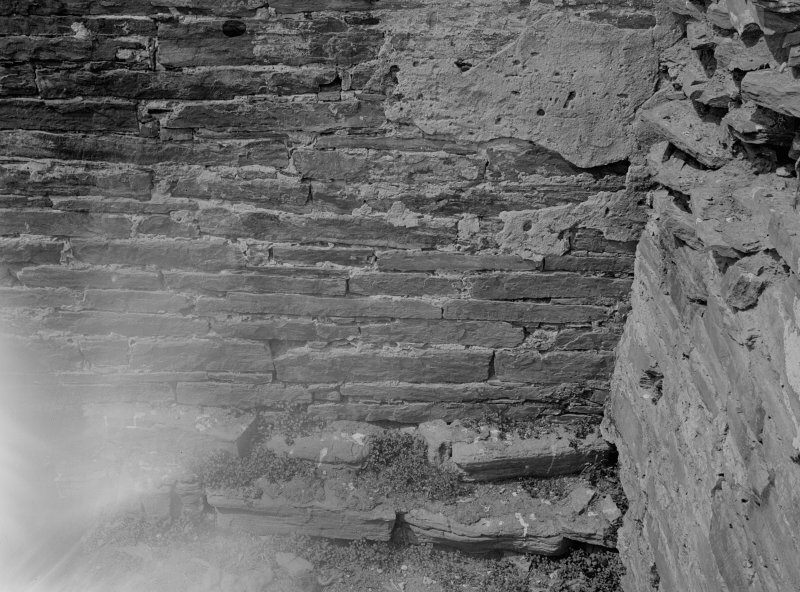 Second Addition: This extended from the N side of the tower, and a forestair against the E wall is evidence for an upper storey. Third Addition: In a subsequent expansion, the W part of the platform was entirely covered by a building enveloping the W side of the tower and its second addition. 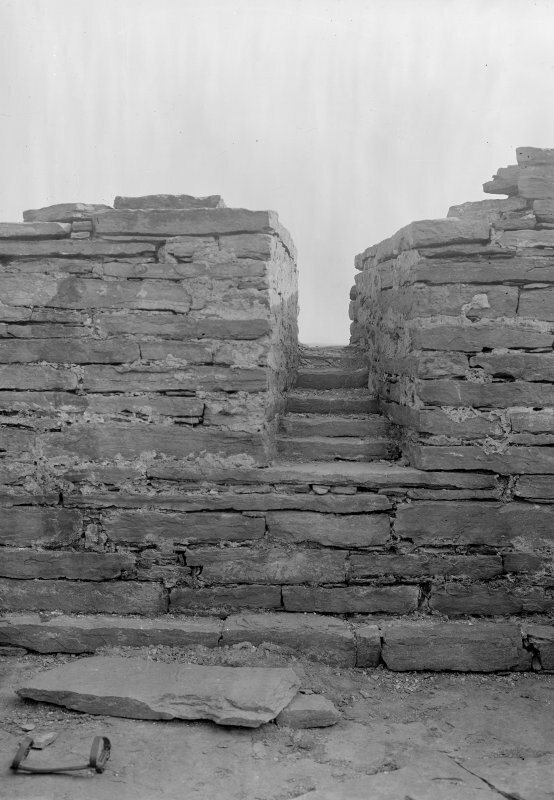 Fourth Addition: Against the E walls of both wing and addition, and end-on to the N side of the passage rose another small extension, possibly a soil-chamber. 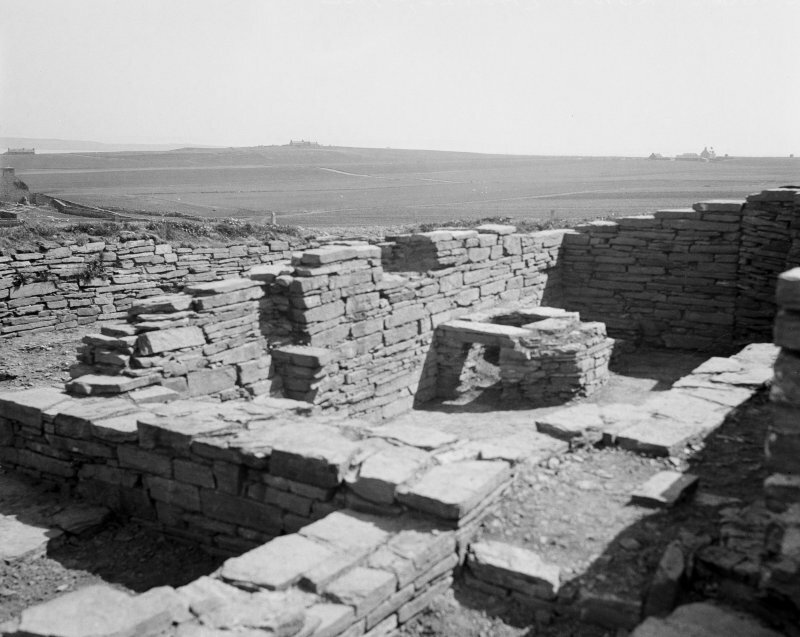 On the S of the passage and the masonry platform extending from the tower are vestiges of still later buildings, including a hall. 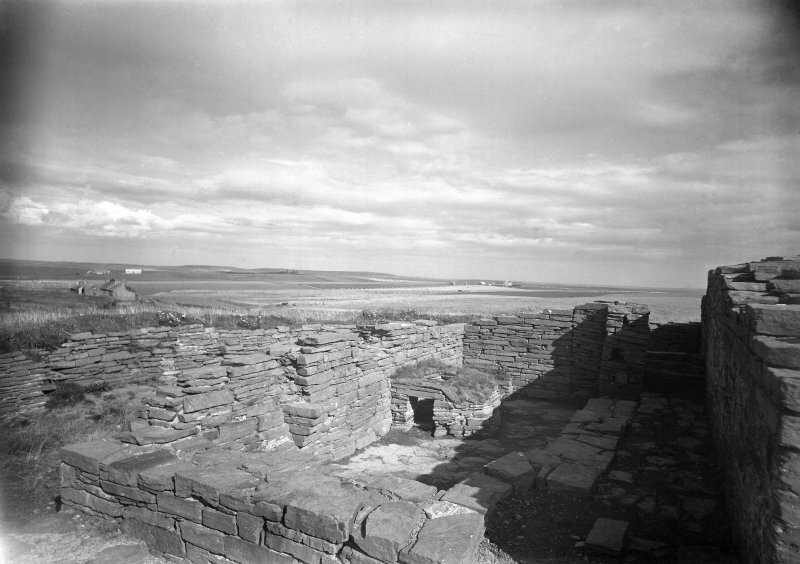 RCAHMS 1946, visited 1935; W D Simpson 1950. 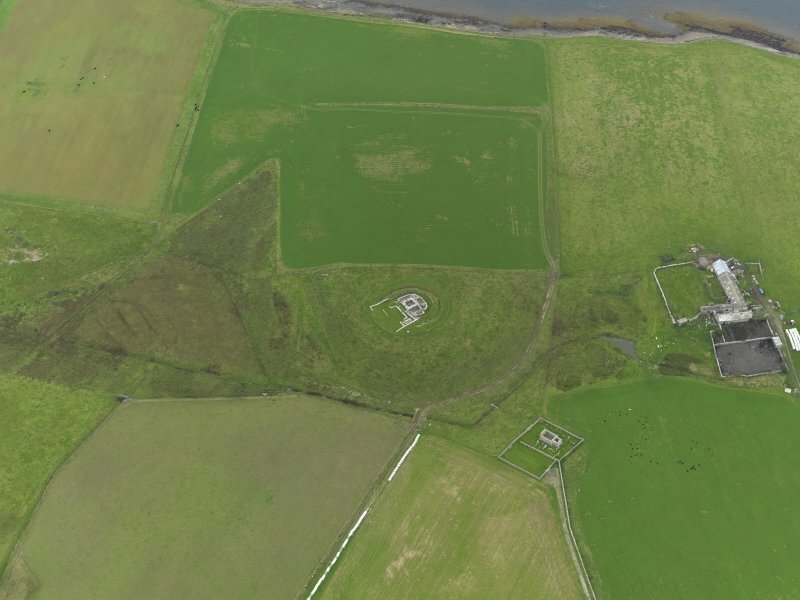 Cubbie Row's Castle (as per DoE [HBM] plaque): As described and planned by the RCAHMS. Visited by OS(ISS) 13 October 1972. Information from Orkney Islands Council and Tourist Board to OS 4 August 1982. 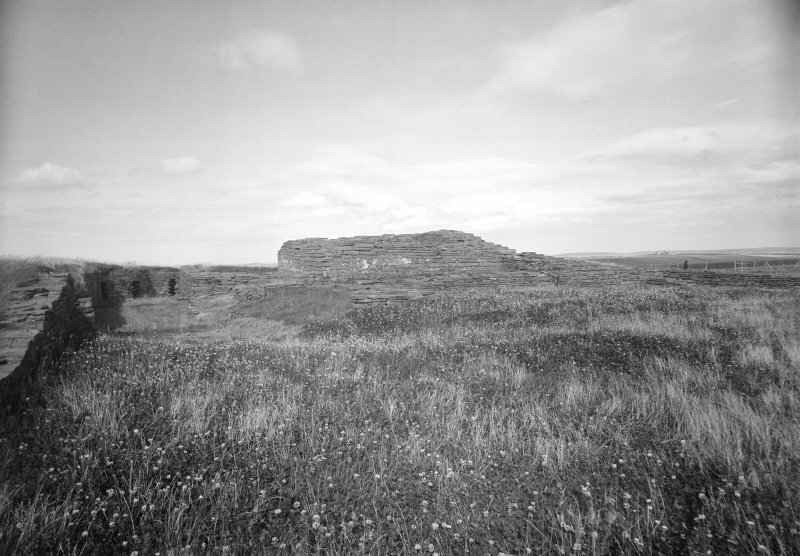 The 'Hakonar Saga' relates that this castle was beseiged in 1231. 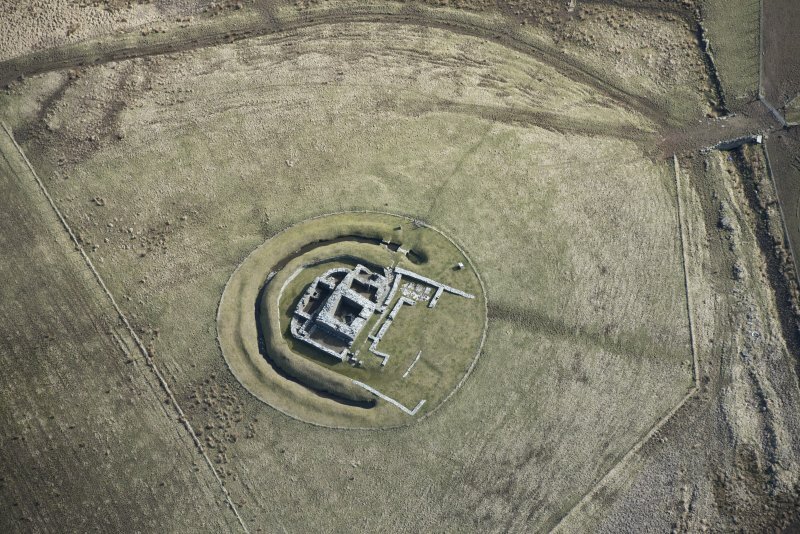 It differentiates between the 'castle' proper, represented by a nearly square mortar-built tower surviving to a height of 2.4 m, and an 'outer castle' which must refer to the substantial outer wall with its outer ditch and counterscarp bank, and to the buildings between it and the tower. 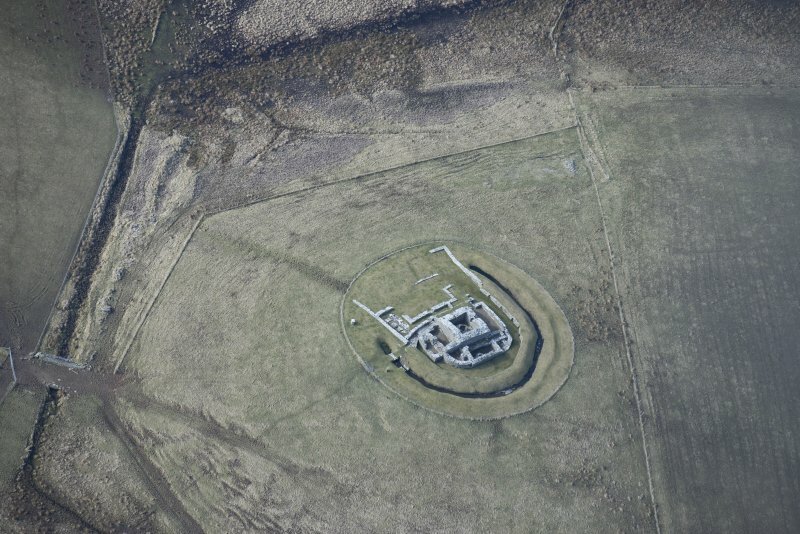 Excavated by HM Office of Works in the 1920s, it is in good order. The finds from the excavation are in the NMAS. Visited by R G Lamb 1982. 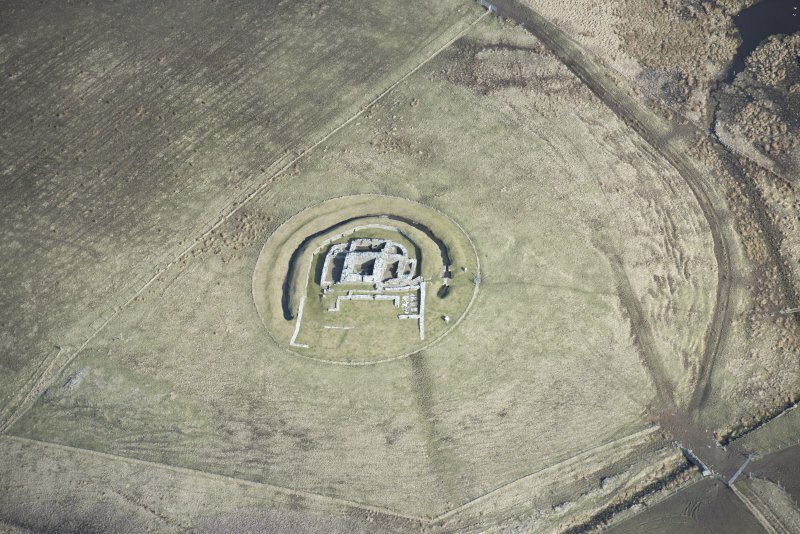 RCAHMS 1982; Orkneyinga Saga; Hakonar Saga; G Barry 1805; L Dietrichson 1906; H Marwick 1928; J S Clouston 1931; RCAHMS 1946; S Cruden 1960; W D Simpson 1961; J G Dunbar 1966; E Talbot. 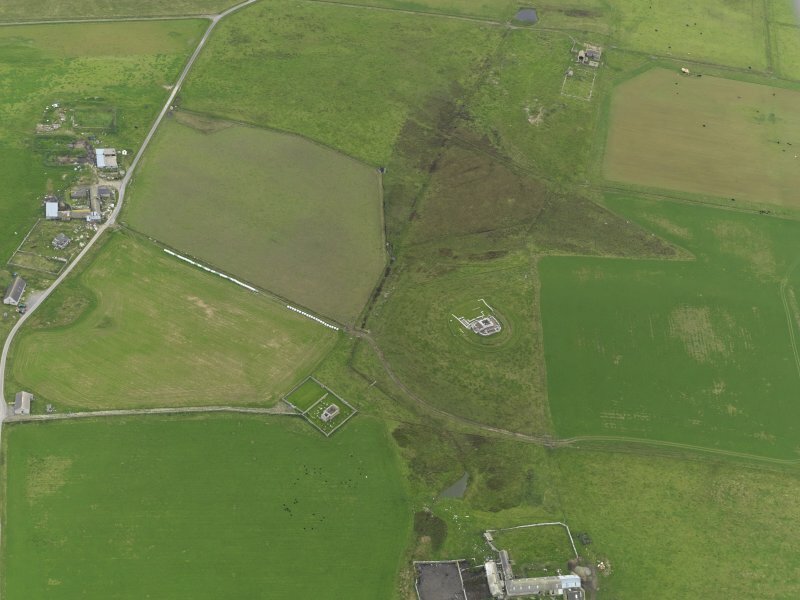 Sites identified as part of a desk-based assessment followed by a broad-scale landscape survey. 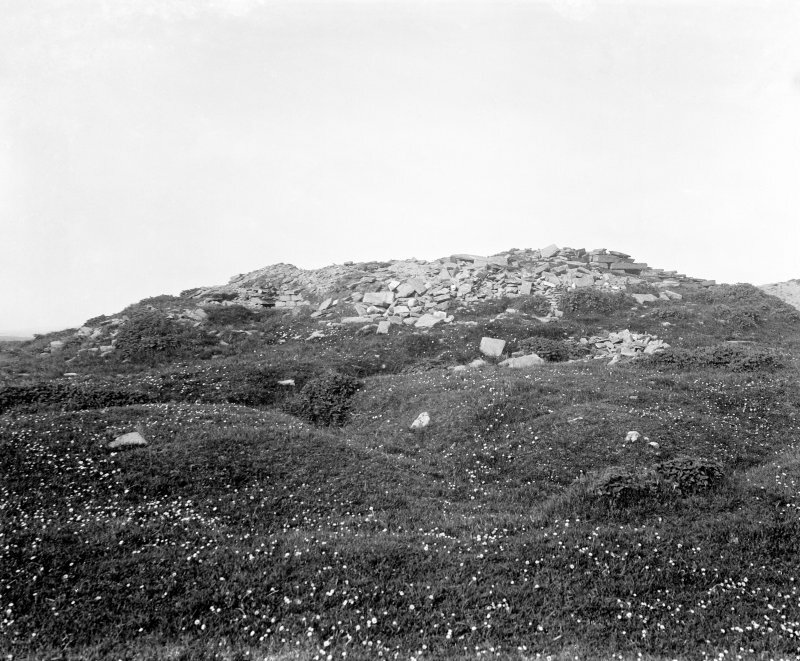 HY 44159 26293 A sub-rectangular stony mound containing some areas of coursed masonry, although not forming any particular structure measuring approximately 15m by 6m and orientated north south. 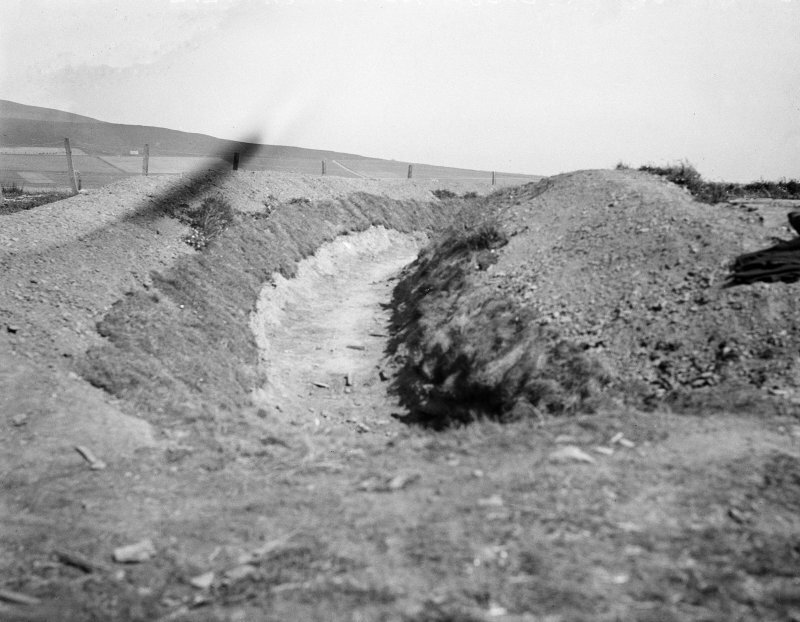 Possible spoil heap containing archaeological material. 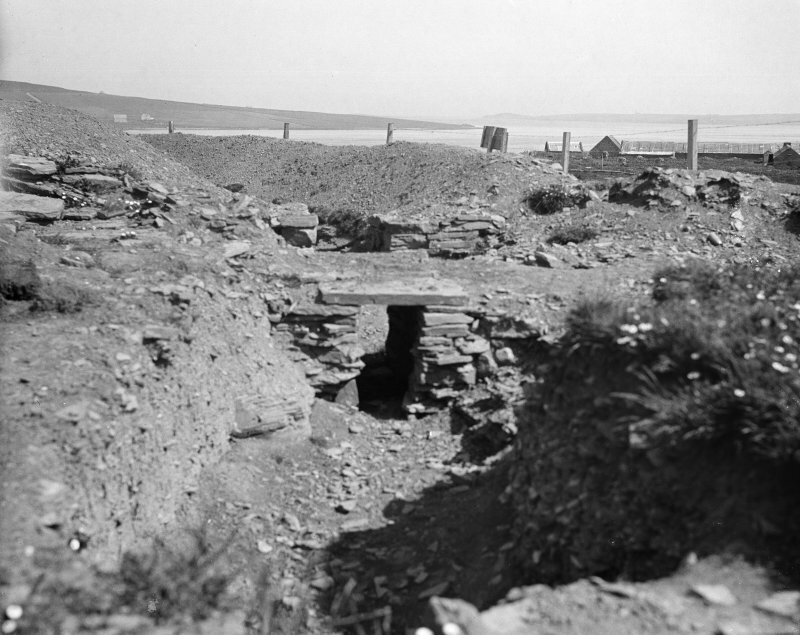 HY 44187 26303 A sub-rectangular building platform on the slope of the mound and just east of the castle. This is orientated north-south and measures approximately 20m by 8m. 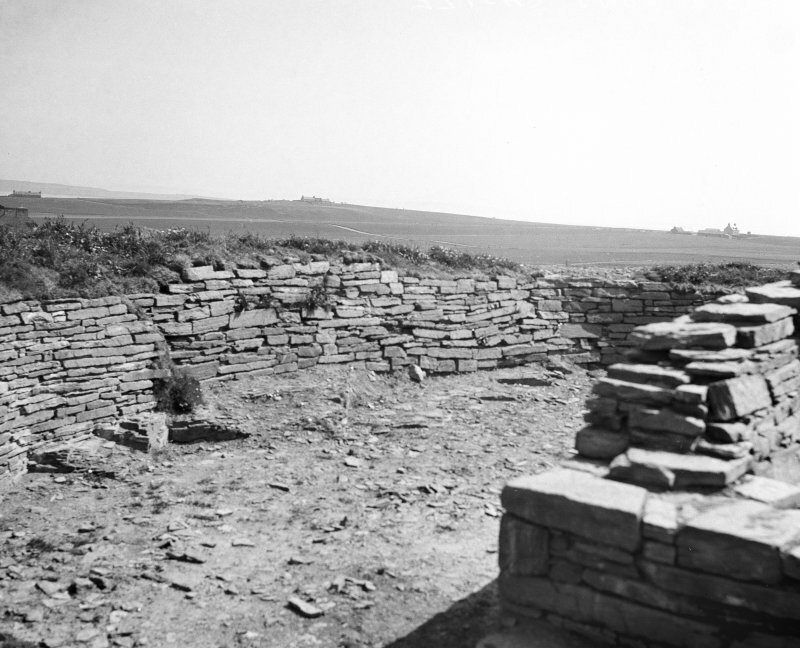 This site relates to where a hen house once stood in the early 20th century, although this was thought to incorporate the remains of a much earlier structure. 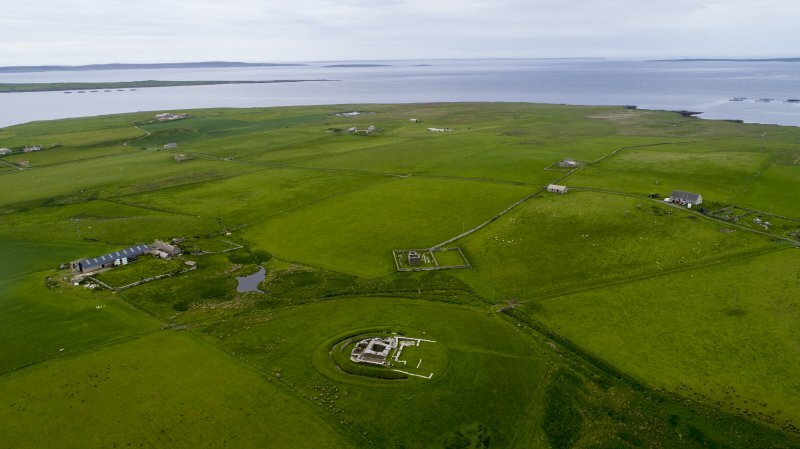 "At that time there was a very able man named Kolbein Hruga farming on Wyre in Orkney. 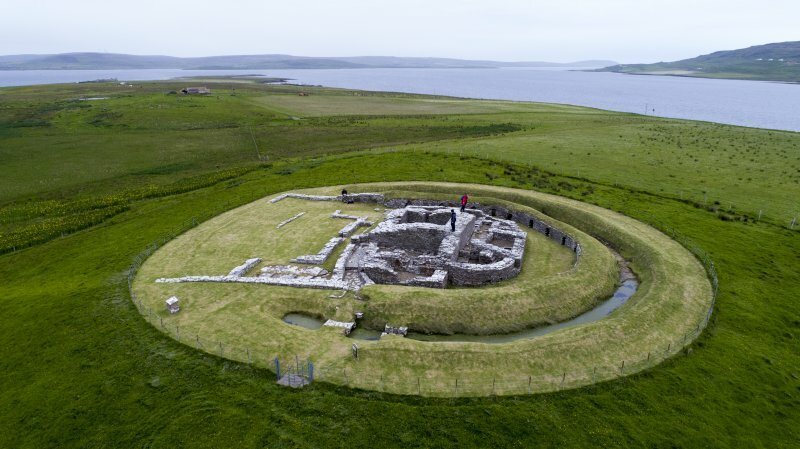 He had a fine stone fort built there, a really solid stronghold" - so records Orkneyinga Saga of events around 1150, and the same castle is described as a difficult place to attack in 1231 in Haakonar Saga. 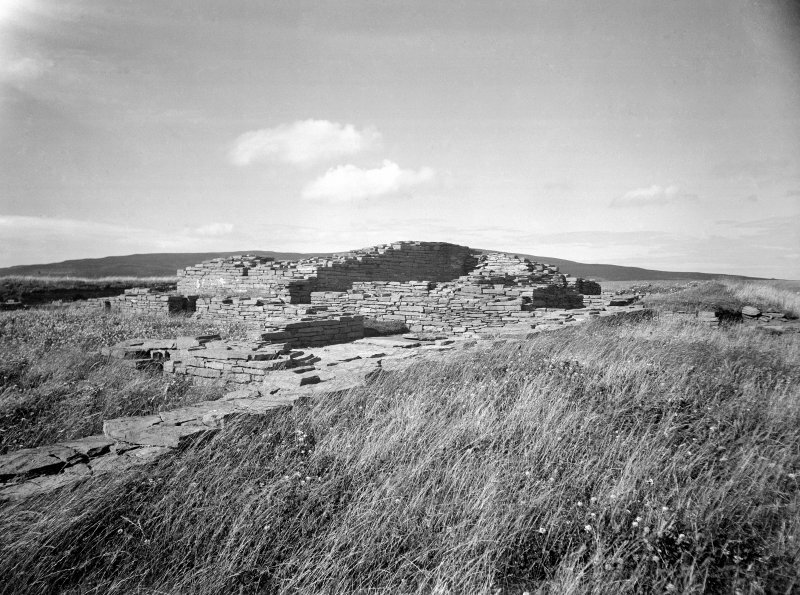 Although in the past there has been controversy over its date, the small stone castle surviving on Wyre is now genera lly accepted as that built in the 12th century by Kolbein, whose Norse nickname would have been Kobbie or Kubbie, hence the modern name, Cubbie Roo (Hruga has become Roo). 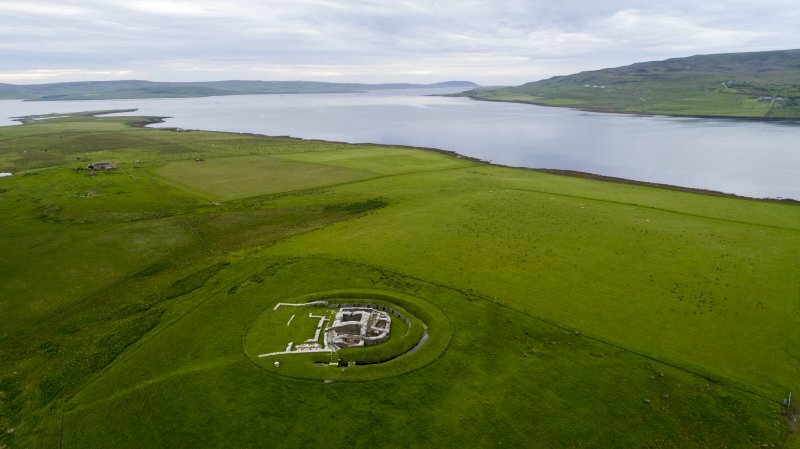 It is thus one of the earliest stone-built castles in Scotland and certainly the best preserved, having been excavated in the late 1920s and later consolidated. 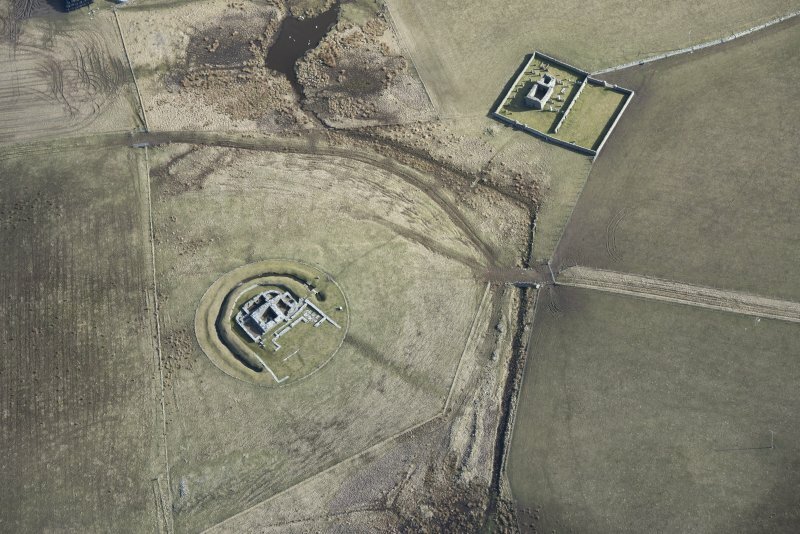 In its original design, the castle consisted of an almost square keep, about 8m across with mortared walls almost 2m thick, surrounded at a distance of about 8m by outer defences: a srone wall with an outer ditch and bank. 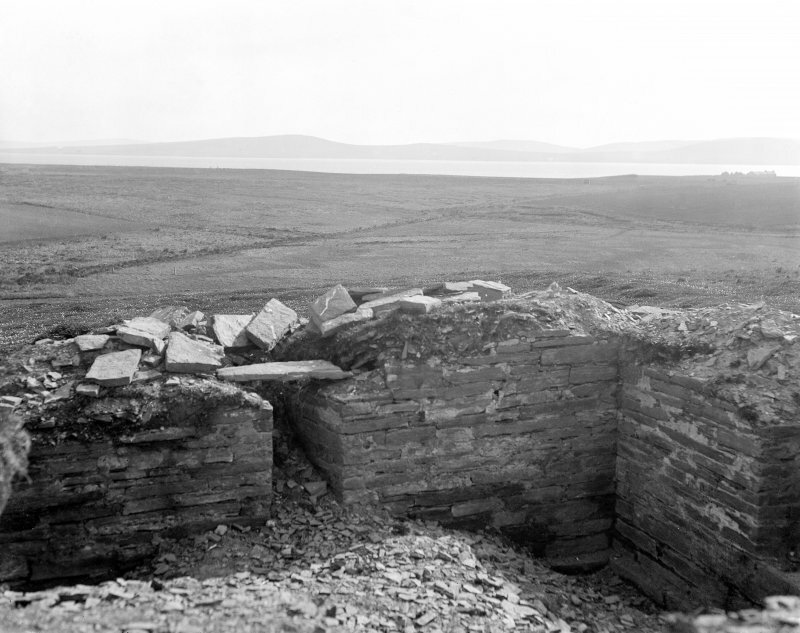 Only the ground floor of the keep survives complete, but it must have risen at least two more floors to have achieve a good view over the island and the surrounding seaways; the narrow projecting ledge that supported the timber first floor can be seen on the inner face of the north wall. 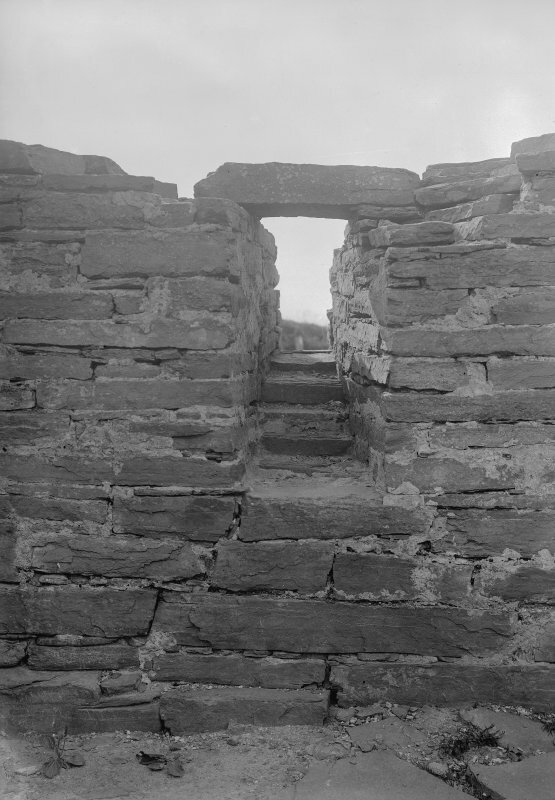 Access to the upper floors would have been by internal wooden ladders, and the sole entrance to the keep was at first-floor level, again reached by a retractable wooden ladder (although this doorway no longer survives, it was recorded in the late 17th century). 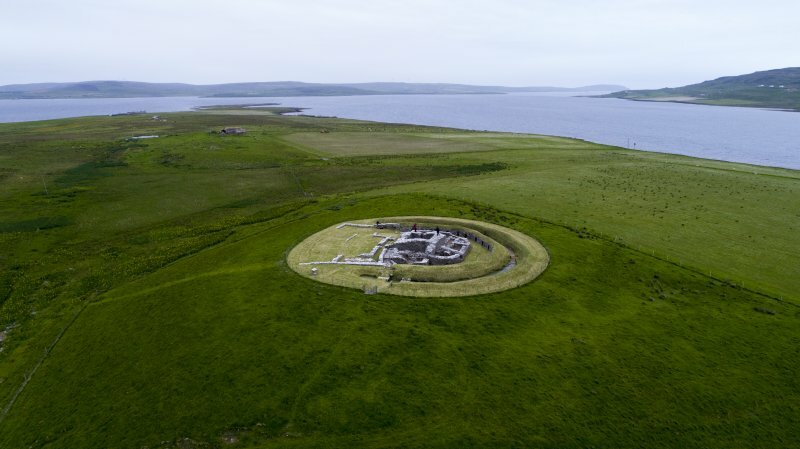 The ground floor was probably used for storing supplies, as were those of later tower-houses, and a rectangular tank cut into the solid rock was presumably used either to store drinking water or to keep a living supply of fish. 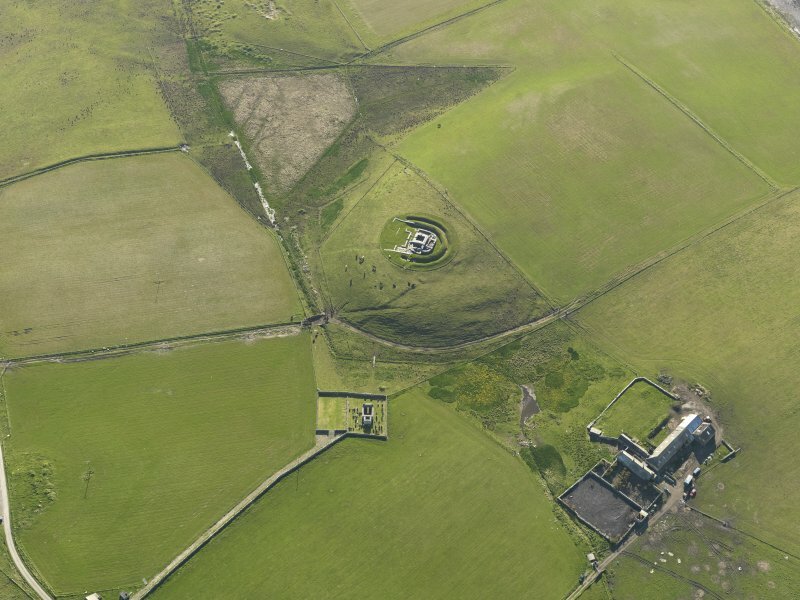 It is doubtful that the keep was a permanent residence; it seems more likely that it was used as a refuge in times of trouble, for its size is quite unsuited to the establishment of an important Norse family, and the name of the adjacent modern farm, the Bu of Wyre, suggests the existence of a separate Norse farmstead with its great hall and outbuildings. 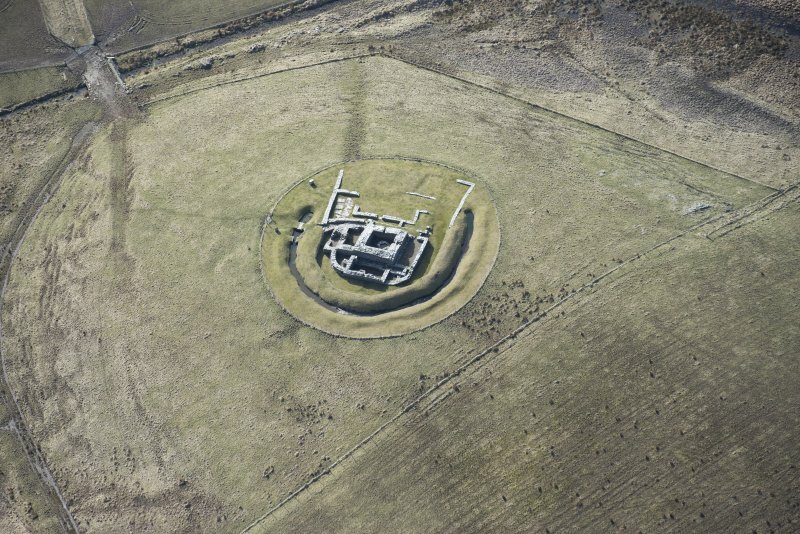 The church belonging to the 12th-century estate still survives (no. 42). The enclosing defences survive only to the west, north and east of the keep, for elsewhere they have been obliterated by later building. 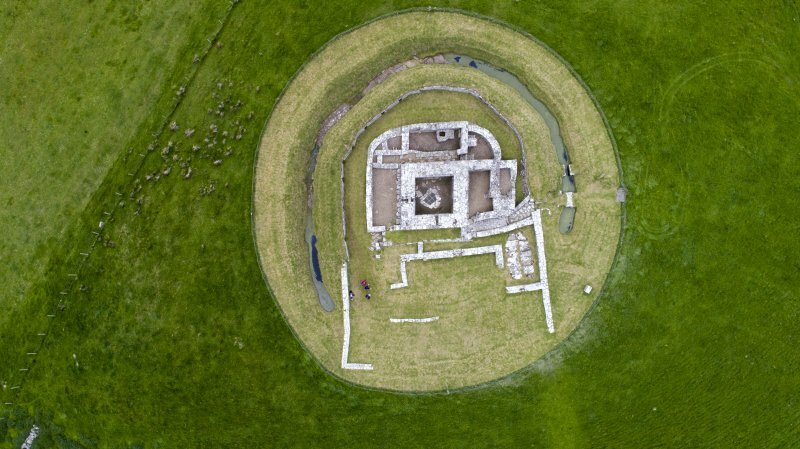 The excavations identified at least five phases of subsequent building and modification around the keep, some of which may be as early as the 13th century, and the entire complex is testimony to the success of the original design. 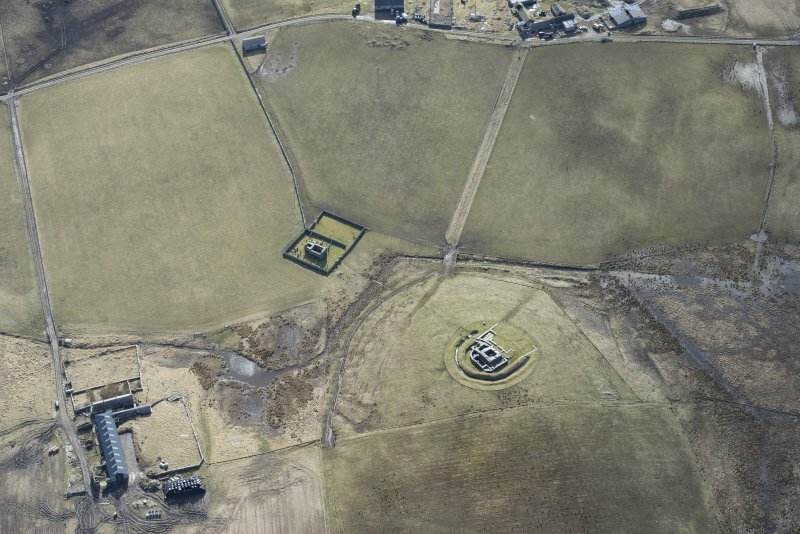 Neither of the other two fortifications mentioned in Orkneyinga Saga, at Cairston near Stromness and on the island of Damsay, survived so long.